He wasn't a government leader, or someone who cured diseases, but Waldo L. Semon, '20, '24, had a profound effect on our lives that carries on to this very day. So many things we come in contact withcomputer, credit card, wall covering, garden hose, food wrap, drainage pipe, plastic bottlesare made from vinyl, just one of several things this brilliant chemical engineer invented during his lifetime. Waldo Semon. Photo courtesy UW Dept. of Chemical Engineering. 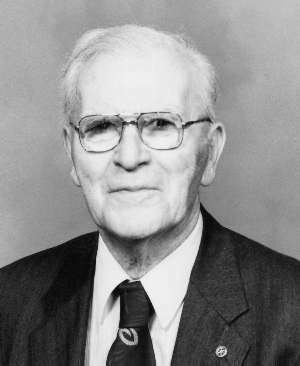 Semon, who died at the age of 100 on May 26 at a nursing home in Hudson, Ohio, changed our world and then helped to save it during his long and distinguished career as a chemist at B.F. Goodrich. He was perhaps most famous for bringing about the age of vinyl, after he was able to convert polyvinyl chloride from a hard, unworkable substance to a pliable one that is used in hundreds of products and accounts for a $20 billion industry. He helped save our world when, just before World War II, he developed Ameripol, a form of synthetic rubber. He went on to play a vital role in creating Government Rubber-Styrene, a synthetic blend of rubber that was essential to the Allied war effort in World War II. Semon was born on Sept. 10, 1898, in Demopolis, Ala., the son of a civil engineer. He moved to the Pacific Northwest when he was 7 years old, and in 1916, entered the UW, determined to be a chemist. He wasn't satisfied with theoretical science alone, so he became a chemical engineer. His Ph.D. in chemical engineering (earned in 1924) from the UW was one of the first in the nation. He was hired on as a faculty instructor at the UW, but found it difficult to live on an instructor's salary. So he did consulting on the side. He was paid $3,000 for his consulting work, equal to his UW salary. The state Legislature, then fighting financial problems, ordered all faculty to donate their consulting fees to the state, and Semon said he was through with academia. After a long career at B.F. Goodrich, he returned to higher education as a research professor at Kent State University.